Before servicing the SRS, turn the ignition switch off, disconnect both battery terminals and wait at least three minutes. Slide the front seat to the full forward position. Remove the center pillar lower finisher. Refer to INT-27, "CENTER PILLAR LOWER FINISHER : Removal and Installation". Release the floor trim hold downs (1) and pull floor trim back. Disconnect the harness connector (A) from the lap belt pre-tensioner. For removing/installing the lap belt pre-tensioner harness connector, insert a thin screwdriver wrapped in tape into the notch, then lift the lock and remove the harness connector as shown. Install the harness connector with the lock raised, and push the lock into the harness connector as shown. After installing the harness connector, check that the lock is pushed in securely. Remove the lap belt pre-tensioner anchor bolt. Remove the seat belt height adjuster cover, then remove D-ring anchor bolt. For removing/installing the shoulder belt pre-tensioner harness connector, insert a thin screwdriver wrapped in tape into the notch, then lift the lock and remove the harness connector as shown. 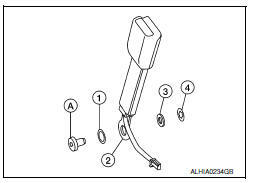 Remove the seat belt retractor anchor bolt and upper bolt, then remove the seat belt retractor. Install the seat belt retractor upper bolt first. Make sure the seat belt height adjuster is locked in the lowest position during installation. Tighten the seat belt retractor bolts to specification. Refer to SB-8, "Exploded View". Make sure both the D-ring anchor and seat belt height adjuster operate freely. Remove the center pillar upper finisher. Refer to INT-28, "CENTER PILLAR UPPER FINISHER : Removal and Installation". Remove the D-ring anchor bolt. Remove the seat belt height adjuster bolts and the seat belt height adjuster. Make sure that the seat belt height adjuster is locked in the lowest position during installation. Tighten the D-ring anchor bolt and seat belt height adjuster bolts to specification. Refer to SB-8, "Exploded View". Remove the front seat assembly. Refer to SE-18, "DRIVER SIDE : Removal and Installation - Seat Assembly" (front seat driver side) or SE-20, "PASSENGER SIDE : Removal and Installation - Seat Assembly" (front seat passenger side). Disconnect the harness connector from the seat belt buckle. Remove the seat belt buckle anchor bolt and the seat belt buckle. Tighten the seat belt buckle anchor bolt to specification. Refer to SB-8, "Exploded View".